Before today’s respirators, patients with several breathing problems relied on a machine called an iron lung. 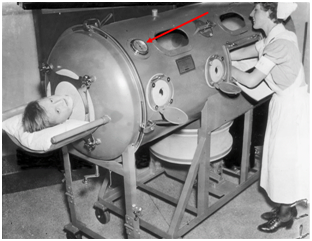 Unlike the modern respirators that use positive pressure (greater than 1 atmosphere) that force air into the lungs, the iron lung was a negative pressure ventilator. The machine surrounded the person and the sealed cavity’s pressure was reduced to induce inhalation by the patient and then the pressure was increased to 1 atmosphere (15 psi or 750 mmHg). While all but obsolete today, these types of machines were extensively used when patients with polio were treated because of loss of muscle control that extended to their ability to breath. Thankfully, Dr. Jonas Salk discovered a vaccine to prevent polio (in 1953) and subsequent vaccines have eliminated polio as a health problem and today positive respirators using microelectromechanical systems (MEMS) pressure sensors can be so small that they are portable. The pressure gauge in this iron lung has been replace in modern respirators by MEMS pressure sensors. Source: Pittsburgh Post-Gazette website. Interested in a little taste of the bubbly? Well, why not? 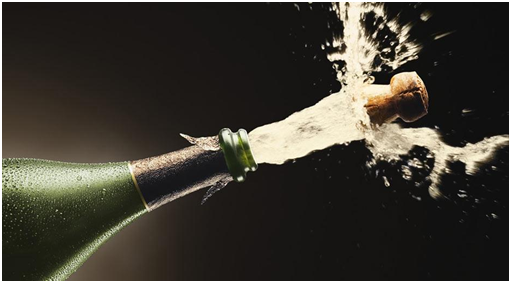 The effervescence adds a substantial taste difference to wine that many people enjoy. Opening a bottle may be a little tricky based on the pressure inside of it. 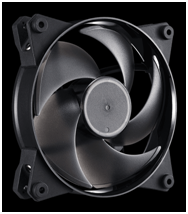 Depending on the wine and the manufacturer, the pressure typically can range from 70 to 90 psi. That’s about five to over six times atmospheric pressure. No wonder the cork can fly across the room if the proper precautions are not taken. In Champagne and other sparkling wines, the pressure is created by carbon dioxide, which forms naturally as yeast interacts with grape sugars. Different fermenting, bottling methods and the type of grapes as well as aging are key factors in the actual pressure inside the bottle. For example, the pressure in a Champagne bottle from France is about 6 bar (90 psi) and, in contrast, a bottle of Prosecco, from northeast Italy, has a pressure of about 3.5 bar (51 psi). Since it has to withstand more pressure, Champagne actually uses a heavier bottle, something a winery would want to know to avoid problems. While putting a pressure sensor on each bottle of wine is impractical, testing each manufactured bottle or at least verifying the manufacturing processes’ capability to consistently provide bottles that can withstand a maximum pressure is just a good manufacturing practice. For these applications, the accuracy and cost effectiveness of microelectromechanical systems (MEMS) pressure sensors that can measure 100 psi certainly makes sense.